Early bird entries cut out on 18 April! Get your entry in now to take advantage of the early bird race entry fee. How are the Bib Numbers for the 3M3D Grand Slam allocated? Do you want your name on our Honour Board? This is how you get it there! Bib numbers for the 3M3D Grand Slam are allocated according to loyalty to the event. Your overall cumulative race time also plays a part. Once you have done five 3M3Ds, you get a permanent bib number and your name is added to the honour board. To date, numbers 1,2,3,4 and 5 are gone! This year we have #6 and #7 up for grabs, as long as Bernie and Pam finish the race. The current numbers below (bar #1-5) will change depending on who registers for the race this year. The bib numbers will be updated closer to race day. For example, Sharon and Fayola have each done two 3M3Ds and they back for their 3rd this year, potentially they can be allocated bib numbers 15 and 16, but it will depend on whether some other past participants register again this year. So potentially they can still end up in the top 20 on the honour board. Yearlings are those competitors who have completed one 3M3D. Their bib numbers will be allocated according to their race times. At this stage, they are just numbered so we can keep track of who has been in the race before. Newbies are new to the 3M3D Grand Slam event. Their bib numbers are allocated according to the date they registered. Their bib numbers will be updated to slot in behind the Yearlings. For the third marathon, bib numbers change (EXCEPT for those who have permanent bib numbers and those who are going for their permanent bib numbers). Numbers are reassigned based on cumulative race times from Day 1 and Day 2. The reason for this is to make life a bit easier for our volunteers andalso for any media coverage at the finish line. The Cairns Marathon, Kauri Half Marathon and Lake Morris 16km numbers are allocated according to the date the participant registered. These will be updated closer to race day pending any cancellations. New to 3M3D? Need a training program? Aimed at the novice runner, these programs will support you to get to the start line and finish your race. You can download our training programs free of charge, or help us out by making a donation! A big congratulations to RACHEL POLLARD who won the FREE entry into the 2018 Tailwind Nutrition 3 Marathons in 3 Days! Rachel also gets a gift pack from our sponsor, Tailwind Nutrition. Rachel is over the moon with the win and has decide to tackle the Grand Slam event. All the best with your training, Rach. The winner was determined by a simple manual random draw using 26 numbers to represent the alphabet. After the first draw (for the first letter of the first name) the number was placed back into the pile before the second draw (for the first letter of the surname). Rachel’s name finally came up after 14 attempts – none of which matched the conditions set for the competition. Thank you to Heidi Sweeting, Glen & Stacey Longmore and Chrissy Warman who helped with the drawing of the prize today. Entries are open. Where are you going to be on 13-15 July 2018? After a slight glitch with the system this morning, we are up and running again. (Okay glitch was due to human error)… Great to see a few of our regulars on the entry list already! And some newbies too. Hope you have hill training on your list of things to do. Tailwind Nutrition entries open tomorrow! Get in at 10am (Brisbane, Queensland time) to get the best entry fees into the event next year. As proud race organiser of the Tailwind Nutrition 3 Marathons in 3 Days, Dynamic Running 👣 is offering you the chance to WIN a guaranteed 2018 race entry, valued at up to $385.00, as well as a gift pack from Tailwind Nutrition. (2) visit our website and sign up for our newsletter. If you have already done those two things in the past, post a comment on the pinned post on our Facebook page, so we know you are interested in the prize! The aim of this competition is to get the word out about our race, please share this post with your friends, running buddies and family. Entries close at 7.00am on 12 November 2017 and the winner’s name will be drawn after the Clifton Beach Series Race on 12 November 2017. The winner will need to supply us with an address to send out the Tailwind Nutrition gift pack. 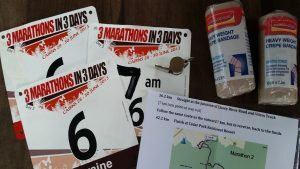 We are in the process of updating our 3 Marathons in 3 Days website. Please be patient if you find a missing link or outdated information! We are working on it… You can try the menu bar at the top of the page to navigate, if a link does not work. There are a few documents still being updated, so they will be added as soon as it’s ready.